An MP3 player with a collection of appropriate music and podcasts can be a great tool in the classroom, whether it's curriculum-related podcasts used to enrich a lesson, or The Lord of the Rings or Harry Potter soundtrack adding a calming ambience to the classroom. The trick, though, is having a speaker system that allows the class to hear the MP3 player. Unfortunately, speakers aren't very common equipment in classrooms yet (in fact, most classroom computers are equipped with headphones), so a prepared occasional teacher needs to bring their own speakers. I've been looking for a suitably loud, yet portable speaker for a couple years now. Most speakers aren't portable enough, or are too small and produce a tinny sound that can't be heard in a classroom. 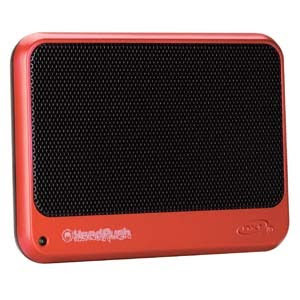 I finally found one that works, though, in the Headrush Crimson Red Pocket Speaker. I even picked it up on sale for $9.99. It's slim, loud enough to fill a room, plugs into the headphone jack of my iPod, and it's even got a fold-out stand so it can be stood up.